Unconventional energy [recovered by hydraulic fracturing] generates income and, done well, can reduce air pollution and even water use compared with other fossil fuels. Alternatively, it could slow the adoption of renewables and, done poorly, release toxic chemicals into water and air. Primary threats to water resources include surface spills, wastewater disposal, and drinking-water contamination through poor well integrity. An increase in volatile organic compounds and air toxics locally are potential health threats, but the switch from coal to natural gas for electricity generation will reduce sulfur, nitrogen, mercury and particulate air pollution. 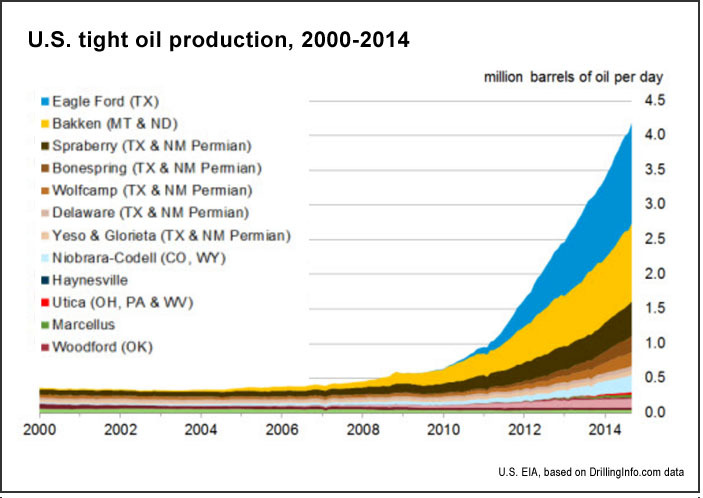 Based on an analysis of the Barnett Shale in Texas, well production tends to drop sharply after initial fracking. Within five years, wells produce on average just 10% of what they did the first month of operation. 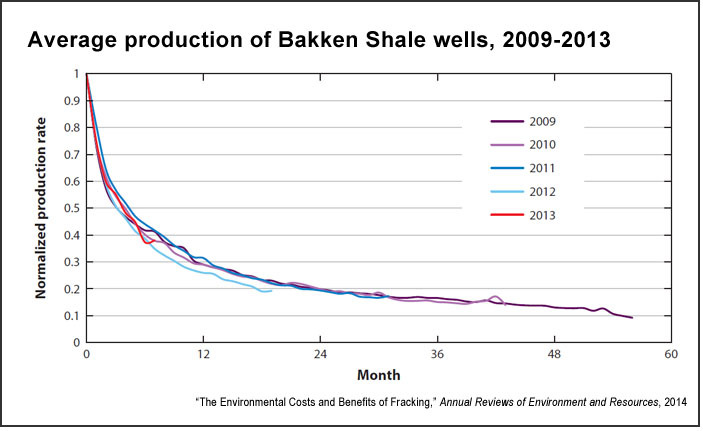 Production for wells in the Bakken Shale show a similar rapid decline. By 2011, productivity of new wells started to decrease as the “sweet spots” were exhausted and subsequent rigs produced less initially and over time. IP fell 22% between 2011 and 2012, despite an additional 10% increase in drilling length. Refracturing existing wells can increase the estimated ultimate recovery (EUR) by 30%, but can’t reverse their overall decline. A 2013 study by the University of Texas of more than 16,000 wells in the state’s Barnett Shale region found that its production will peak around 2015, and decline slowly thereafter, and this despite 15,000 more wells being drilled by 2030. This has been called the “Red Queen” syndrome, named after the Alice in Wonderland character who must run faster and faster just to stay in the same place. Fracking a single well can require anywhere from 2 to 20 million gallons of water, with another 25% used for operations such as drilling and extraction. While water use for fracking is in general small relative to agricultural and municipal consumption — it represents less than 1% of total water use in Texas, compared to 56% for crops and 26% for municipalities — it can be quite high in specific areas and time frames. For example, in counties located in the Haynesville, Eagle Ford, and Barnett shales, fracking operations were responsible for 11%, 38%, and 18% of total groundwater use. At its peak, net water use for fracking is projected to increase as much as 136% in the Haynesville Shale, 40% in Barnett and 89% in Eagle Ford. The volume of water used per energy generated — known as its water intensity — is lower for fracking than other fossil fuels and nuclear: Coal, nuclear and oil extraction use approximately two, three and ten times, respectively, as much water as fracking per energy unit, and corn ethanol can use 1,000 times more if the plants are irrigated. By comparison, renewables such as wind and photovoltaic solar energy require almost no water. Publicly available data on well failure rates are still relatively scarce. Pennsylvania State records from 2010 to 2013 indicated that between 3% and 6% of wells in the Marcellus Shale failed. The most extreme form of failure, a blowout, can cause tremendous damage but is rare: A 2013 study in GeoScienceWorld found that of 3,533 Marcellus wells drilled from 2008 to 2011, only four experienced blowouts. One standard measure of how closed wells are performing is “sustained casing pressure” (SCP), an indication that one or more barriers within a well has failed. While it does not always result in environmental contamination, SCP indicates that contamination is possible. Two studies of the drinking water of a total of 209 homes overlaying the Marcellus Shale in Pennsylvania found evidence of hydrocarbon pollution. The first study found “17 times higher methane concentrations for the homes,” while the second concluded that “casing and cementing issues were the likeliest causes for the fugitive GM that they observed in the shallow aquifers.” On the other hand, a study of 127 homes over Arkansas’s Fayetteville Shale found no evidence of contamination. While the probability of groundwater contamination is “strongly debated and universally controversial,” drilling specialists have identified casing and cementing problems as one of their primary environmental concerns. Earthquakes induced by hydraulic fracturing are rare, and those that can be felt by humans are rarer still — only “a handful” of cases have been documented so far, none of greater than 4 Mw. Some cases occur when fracturing is used in areas in existing fracture zones, which are sometimes intentionally targeted because they can result in increased gas production. While earthquakes induced by wastewater injection are less frequent than those caused by fracking, their magnitude tends to be greater: “In 2011 alone, earthquakes of 4.0 to 5.3 Mw were linked to deep wastewater injection in locations such as Youngstown, Ohio; Guy, Arkansas; Snyder and Fashing, Texas; and Trinidad, Colorado.” The most severe, 5.7 Mw, destroyed 14 homes and injured two people in Oklahoma. Unconventional energy extraction is a source of air pollution throughout the preparation, extraction and closure phases. Access roads must be built, the well pad cleared and the bore itself drilled; diesel engines power the fracturing phase. During extraction, wastewater is stored in tanks or open ponds, and any volatile organic compounds (VOCs) are either vented or flared. According to a 2010 study from the U.S. Government Accountability Office (GAO), in 2006 up to 5% of the natural gas production on federal lands in the western United States was lost in this way. Atmospheric sampling has indicated even higher rates of escape: A 2013 study in Geophysical Research Letters estimated that in the Uinta Basin of eastern Utah, 55,000 kilograms of methane per hour leak into the atmosphere, the equivalent of 6.2% to 11.7% of total natural gas production in the region. Operations related to unconventional energy can also have substantial impacts on air quality: In the Denver basin, more than 6,000 petroleum and condensate tanks are responsible for more than 70% of total VOC emissions from all sources, according to the Colorado Department of Public Health and Environment. One of the greatest potential benefits of unconventional energy is the potential for natural gas to displace electrical generation from coal: “Replacing coal with natural gas for power generation would substantially reduce emissions of CO2, particulate matter (PM), nitrogen oxides (NOx), sulfur dioxide (SO2), and metals such as mercury (Hg).” However, as stated above, the study does not see worldwide coal consumption falling despite the rise in unconventional energy. The researchers conclude with five recommendations. First, greater transparency is required from companies and regulating agencies. Some information is available on the FracFocus disclosure registry, but more is needed. Second, short- and long-term studies are required on the potential effects of fracking on operations on human health — “virtually no comprehensive studies have been published on this topic,” they note. Third, predrilling data, including environmental quality and human health, would be in all parties’ interests. Fourth, because most problems result from surface operations, including faulty wells, spills and leaks, additional work on best practices is required. Finally, funds should be created to address future, unknown problems that could arise from the current oil and gas boom. “Drilling millions of new oil and natural gas wells will inevitably lead to future issues,” they note, and authorities and firms should work to ensure that the resources are available to deal with them. Related research: A 2014 study in Journal of Infrastructure Systems, “Estimating the Consumptive Use Costs of Shale Natural Gas Extraction on Pennsylvania Roadways,” analyzes the damage that fracking operations impose on local transportation infrastructure. The researchers, based at the RAND Corporation and Carnegie Mellon University, estimate that the road-reconstruction costs associated with a single horizontal well range from $5,000 to $10,000. While this figure appears small, because there were more than 1,700 wells drilled in Pennsylvania in 2011 alone, the total costs for that year was between $8.5 and $39 million — costs paid by state transportation authorities, and thus taxpayers. Citation: Jackson, Robert B.; Vengosh, Avner; Carey, J. William; Davies, Richard J.; Darrah, Thomas H.; O’Sullivan, Francis; Petron, Gabrielle. “The Environmental Costs and Benefits of Fracking,” Annual Reviews of Environment and Resources, 2014, 39:327–62. doi: 10.1146/annurev-environ-031113-144051.